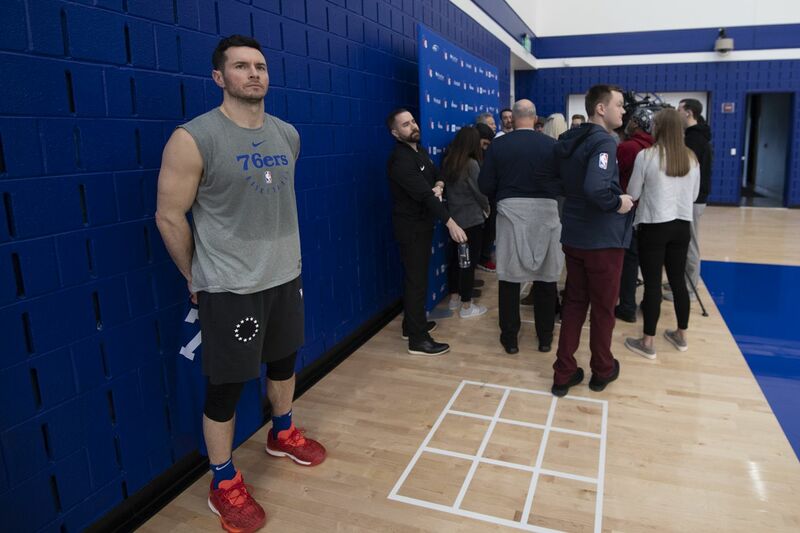 JJ Redick, waits to talk to reporters after a practice at the Sixers' training facility in Camden on Monday. WASHINGTON -- JJ Redick will miss his second straight game with lower-back tightness when the 76ers face the Washington Wizards at Capital One Arena. Like in Tuesday’s game against the Wizards at the Wells Fargo Center, Furkan Korkmaz will replace the shooting guard in the starting lineup. Redick is averaging a career-best 18.3 points while shooting 37.8 percent on three-pointers. Meanwhile, Korkmaz is averaging 6.4 points, 2.4 rebounds 1.3 assists. This will mark his fourth straight start; he started in place of Jimmy Butler (upper respiratory infection) Saturday (win vs. Dallas) and last Wednesday (win at Phoenix). Korkmaz will join Ben Simmons, Wilson Chandler, Joel Embiid and Butler in the starting lineup. The Sixers (27-14) look to extend their winning streak to five games. The Wizards are 16-25.